A polished action thriller, The Equalizer offers plenty of style and an immersive Denzel Washington performance, but also a limited premise stretched over an unnecessarily long running time. In Boston, former CIA operative Bob McCall (Denzel Washington) lives a lonely quiet life, works at a home improvement store, and still grieves the loss of his wife. Most nights he is unable to sleep and whiles away the hours at a 24/7 diner, where young prostitute Alina (Chloë Grace Moretz) is also a regular. Bob and Alina strike up conversations and become friends of sorts. When Alina gets badly roughed up by her Russian mobster pimp, Bob hunts down the den of gangsters and kills five bad guys in 28 seconds. Unfortunately, the dead Russians are part of a much larger criminal cartel controlled by the Moscow-based Pushkin (Vladimir Kulich) and involved in bribery, corruption and extortion on a national scale. Pushkin dispatches his top henchman Nicolai (Marton Csokas) to find out who killed his men. Nicolai teams up with corrupt police officer Frank Masters (David Harbour), and they start to hunt down McCall to seek revenge. Directed by Antoine Fuqua and based on the 1980s television series, The Equalizer oozes with elegance. While the story is standard fare involving hissing Russian villains and an incredulously indestructible hero, Fuqua's weapon is Denzel Washington in fine form. Together director and star create enough depth in the central character to elevate the film above the merely ordinary. McCall suffers from a combination of obsessive compulsive disorder, insomnia, and leftover depression from his wife's death. These ailments are hinted at on the margins of the film, creating enough of a tantalizing taste that this is a person with a rich emotional history worth spending time with, despite his loner tendencies. Fuqua's best and worst attributes are revealed in the two highlight action scenes. McCall's cool invasion of the gang hangout to eliminate the scum responsible for Alina's agony is a masterpiece of build-up and execution. But later McCall has to deal with a dozen or so heavily armed goons in a home improvement warehouse store. That scene is both prolonged to the point of exhaustion and starts to resemble a slasher film parody, with McCall taking down his enemies one by one with an assortment of power tools rigged into weapons of death. 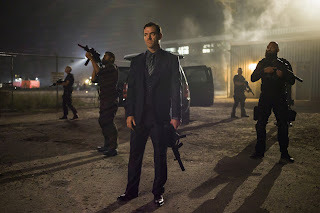 Marton Csokas provides a sturdy enough counterpoint to Washington, but Chloë Grace Moretz is shortchanged as she disappears from the film for a very long time. Melissa Leo and Bill Pullman appear in one scene as McCall's former colleagues from his prior life with the CIA. The Equalizer is effective in what it does, but it does relatively little and for too long.